In my last article, I referred several times to the Nikon F, the predecessor of the Nikon F2. When speaking of the chronology of professional photography, the Nikon F should come first as a camera that should not be ignored. The high esteem and legend of the Nikon F have been discussed many times before. Here, I'll review in detail the design concept and features of this camera. Surprisingly, this has not been done before. Why is the Nikon F so famous ? Users appreciated the camera's design and features. The reason why the two lists of features above don't jibe is because I have grouped them in different ways. In principle, camera designers should always take the user into consideration. In practice, though, this doesn't happen very often. But this is what occurred between the designers and users of the Nikon F, and it remains a rare case in the history of camera production. Put simply, I think the healthy relationship that developed between the two parties was due to the fact that optical engineers at Nippon Kogaku contributed directly to it. To understand the concept and purpose of the development of the Nikon F, we must first understand the history of SLR cameras and trends in engineering at that time. Single-Lens-Reflex cameras with one type of viewfinder were in use as far back as the 16th century. This was one variety of "camera obscura," a device consisting of a dark chamber and a lens that was used to sketch objects such as landscapes, though it was not a photographic camera per se. The type of viewfinder used in these primitive models actually remained in use long after "newer" technologies had been developed. Up to the early 20th century, camera technologies progressed slowly. In the late 1930s, 35mm(135)-film-format SLR cameras appeared, a reflection of technological development. A single-lens-reflex viewfinder convenient for shooting with telephoto lenses or close-ups was combined with a compact camera's features. However, those 35mm(135)-film-format SLR cameras were not convenient to handle. Direct optical viewfinder cameras, such as the Leica and the Kodak Rethina, provided faster shooting speed and surpassed those SLR cameras in terms of convenience. It was clear that at that time, technologies had not been fully developed to tap the great potential of SLR cameras. After World War II, some SLR cameras with a pentaprism viewfinder appeared in Europe. Before then, an SLR user had to position his head above the viewfinder ; even then, he saw the images in reverse. With pentaprism viewfinders, these faults were eliminated. Those involved in camera development showed a deep interest in pentaprism viewfinders, while casual photography buffs barely took note. For the occasional user, the only real benefit of the pentaprism viewfinders was that the image was not in reverse - the SLR, they thought, still had too many drawbacks and was too inconvenient for everyday use. At that time, most photographers thought SLR cameras were just too complicated to operate. Still, professional engineers and designers knew pentaprism viewfinders to be the key to making SLRs cameras suited to everyday use. With the technology available, they thought, they could eliminate many of the perceived defects and create an excellent camera. It was during this period that serious SLR research began. In 1955, Nippon Kogaku started in earnest to develop the Nikon SP, a camera that would be the world's best, to succeed the Nikon S2. This new camera, Nippon Kogaku believed, would be superior to the Leica M3. After developing many camera bodies and interchangeable lenses for the S2, Nippon Kogaku realized that the development of direct optical viewfinders and coupled rangefinder was approaching its technological limits. Though lenses had become brighter and shooting areas wider, advancements in focusing accuracy had stagnated and viewfinder technology wasn't progressing as quickly as they would have liked. For example, focusing was impossible with accessory viewfinders for interchangeable lenses and the views were not clear. To solve these problems once and for all, Nippon Kogaku's engineers decided to undertake intense technological study of SLR cameras. Among the goals they set for themselves were that the new SLRs had to offer a shooting speed as fast as the SP and be just as easy as the SP to operate. In this way, planning for the Nikon F started while the SP was still being developed. For the first time, Nippon Kogaku was developing two(2) cameras simultaneously. Priority was given to the SP as the F became a secondary project for the company. By 1957, development of the Nikon SP had been concluded. In February of that year, Nippon Kogaku began concentrating all its energies on developing the F.
At that time, however, the Asahi Pentax had been introduced, right on the heels of the Miranda, the first pentaprism SLR in Japan. Other new-generation SLRs, including the Minolta SR-2 and Znow, had appeared in succession, and offered the three major SLR technologies : pentaprism viewfinders, quick-return mirrors and fully automatic diaphragms. Just as important, their operation was as easy as the rangefinder cameras. Some of them were big hits in the market. 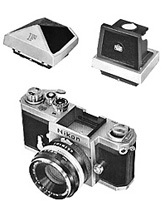 Some unique ideas that would be applied to the Nikon F were included in these other models. With the unveiling of these new competitors, development of SLRs at Nippon Kogaku, which began early but had progressed slowly, accelerated. It looked like Nippon Kogaku would be the last company to develop SLR cameras. However, its ideas and designs were ahead of the competition, a reflection of how serious and earnest the company was about SLR technology. When Nikon's first camera appeared, many professional photographers entrusted it for their most important photos. Again, when talking about the history of Nikon, it is important to note that the development of the Nikon F was directly affected by the input and influence of professional photographers. For example, in Japan(Nippon) only Nikon cameras offered interchangeable lenses in the true sense of the word. For domestic cameras compatible with interchangeable lenses, there were in reality only normal lenses available. Problems that would probably occur when using wide-angle or telephoto lenses did not affect those cameras. For the Nikon S or S2, conversely, 2.8cm and 10.5cm lenses were available in addition to 3.5cm lenses. This reflects the fact that accurate composition and focusing were very important for Nikon cameras and the people who designed them and would use them. Nippon Kogaku lavished its power and energy on developing the Nikon SP to create an extremely elaborate and super-high-grade camera with built-in viewfinders with a range of 2.8cm to 13.5cm. No camera at that time - not even the Leica M - had this feature. Nippon Kogaku did its best to develop other features and functions within the limits of building a compact, albeit elaborate, camera. However, the Nikon SP still required an accessory viewfinder for focal lengths not covered by the built-in viewfinder. In addition, a safety rate was required for frame coverage of the finder. Unnecessary images were always exposed because the actual exposed image area was wider than the area seen through the finder. Close-up shots were, of course, rather inaccurate, despite that they required very complicated operations. Nikon users rated the S2 and SP very highly. Ironically, Nippon Kogaku engineers and designers were discontented with the S2 and SP, causing their desire for a more complete camera to grow. In planning of the Nikon F, Nippon Kogaku engineers racked their brains to make an SLR camera that would exceed direct optical viewfinders and coinsidence-type rangefinders. At the same time, they examined SLR "defects" in detail and worked diligently to reduce or eliminate them. Their idea to develop the desirable points and reduce the stumbling blocks to fully reveal the capability of an SLR camera was, in actuality, very ordinary. What is unique is that they made extraordinary efforts to realize the idea. The idea produced a lot of features, including "100% viewfinder frame coverage," "interchangeable focusing screens," "interchangeable viewfinders," "large bayonet mounts," "mirror-up devices," and "fully automatic diaphragms." Now, let's see how SLR characteristics were used to develop these features. I will first talk about the 100% viewfinder frame coverage. With SLR cameras, the user sees images through the lens and the film senses light passing through the same lens. If the view framed in the finder is the same size as the shooting frame, what user sees will be exposed on the film. With the small-size picture format of 35mm(135) film, no trimming is necessary and minimum enlargement is needed, and high-quality clear pictures will be produced. With direct optical viewfinders, on the other hand, the frame coverage cannot exceed approximately 90% at infinity because mechanical and/or optical errors are unavoidable, even if a correction system for viewing / shooting is provided. Of course, SLRs also require pinpoint adjustment to assure 100% frame coverage. Once adjusted, SLR cameras always provide absolute accuracy. In short, no error will occur. Some SLR cameras provide only 90% frame coverage because the adjustment to eliminate errors was not included in the manufacturing process. With 90% frame coverage, a 24mm lens (developed later for the Nikon F) produces a picture angle of a 28mm lens through the viewfinder. These may seem like trifling matters, but they are very important in the pursuit of high-level, accurate performance. There are several types of focusing screens : SLR and TLR with or without fresnel lens; plotting image; split image; cross image; aerial image; etc. It is hard to say which one is appropriate for the shooting object. Also, it is important to consider that SLRs are used for some highly specialized purposes, such as astronomical telescopes, microscopes and other sophisticated scientific applications. So, with the Nikon F, the viewfinder and the focusing screen became interchangeable. Though this might seem self-obvious, it is very difficult to fit the screen unit in a frame into the small space around the viewfinder. The standard viewfinder for an SLR before the development of the pentaprism was the waist-level viewfinder. A fixed pentaprism, a new concept at the time, was a popular feature of the SLR cameras before the Nikon F. Most SLR cameras have adopted eye-level viewfinders and fixed pentaprisms that provide well-organized constructions and "lightness." However, Nikon cameras were (and are) used for all different purposes, including photography not suitable for using eye-level viewfinders. Therefore, despite the fact of a slight increase in camera size, the Nikon F still employed an interchangeable viewfinder. Designers also tried to make it easier to change the focusing screen by making the attachment surface bigger. These interchangeable systems, as most of you know, allow dust particles to enter the viewfinder. But this viewfinder is made for people who are aware of this, yet still need the viewfinder to be interchangeable. In this chapter, we have discussed the development of the Nikon F by concentrating on the viewfinder. The viewfinder is directly related to the functions of an SLR camera, so it is easier to describe why it was developed in such a way. However, there are other parts that make a Nikon F an "SLR" camera. We'll talk about the other parts that originally came from the Nikon SP --- although the Nikon SP is not an SLR camera.